Japan is an island nation in East Asia comprising a stratovolcanic archipelago extending along the Pacific coast of Asia. It lies between 24° to 46° north latitude and from 123° to 146° east longitude. The country is southeast of the Russian Far East, separated by the Sea of Okhotsk; slightly east of Korea, separated by the Sea of Japan; and east-northeast of China and Taiwan, separated by the East China Sea. The closest neighboring country to Japan is the Russian Federation. The major islands, sometimes called the "Home Islands", are (from north to south) Hokkaidō, Honshū (the "mainland"), Shikoku and Kyūshū. There are also 2,456 islands, including Okinawa, and islets, some inhabited and others uninhabited. In total, as of 2006, Japan's territory is 377,923.1 km2 (145,916.9 sq mi), of which 374,834 km2 (144,724 sq mi) is land and 3,091 km2 (1,193 sq mi) water. This makes Japan's total area slightly smaller than the U.S. state of Montana, and slightly larger than Norway. Location: Eastern Asia, island chain between the North Pacific Ocean and the Sea of Japan, east of the Korean Peninsula. notes: Includes the Bonin Islands, Daitō Islands, Minami-Tori-shima, Okinotorishima, the Ryukyu Islands, and the Volcano Islands. Ownership of the Senkaku Islands and Liancourt Rocks (Japanese:Takeshima, Korean:Dokdo) is in dispute. territorial sea: 12 nmi (22.2 km; 13.8 mi); between 3 and 12 nmi (5.6 and 22.2 km; 3.5 and 13.8 mi) in the international straits—La Pérouse (or Sōya Strait), Tsugaru Strait, Osumi, and Eastern and Western Channels of the Korea or Tsushima Strait. Terrain: mostly rugged and mountainous, can easily be compared to Norway, both having about 70% of their land in the mountains. Natural resources: small deposits of coal, oil, iron, and minerals. Major fishing industry. About 72% of Japan is mountainous, with a mountain range running through each of the main islands. 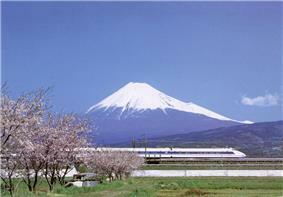 Japan's highest mountain is Mount Fuji, with an elevation of 3,776 m (12,388 ft). Since so very little flat area exists, many hills and mountainsides are cultivated all the way to the top. As Japan is situated in a volcanic zone along the Pacific deeps, frequent low-intensity earth tremors and occasional volcanic activity are felt throughout the islands. Destructive earthquakes occur several times a century. Hot springs are numerous and have been exploited as an economic capital by the leisure industry. 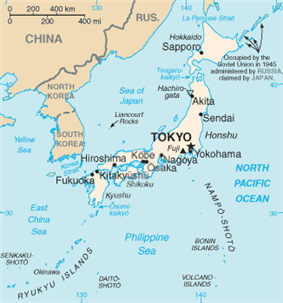 The mountainous islands of the Japanese archipelago form a crescent off the eastern coast of Asia. They are separated from the mainland by the Sea of Japan, which historically served as a protective barrier. The country consists of four principal islands: Hokkaidō, Honshū, Shikoku, and Kyūshū; more than 3,000 adjacent islands and islets, including Izu Ōshima in the Nanpō Islands; and more than 200 other smaller islands, including those of the Amami, Okinawa, and Sakishima chains of the Ryukyu Islands. The national territory also includes the small Bonin or Ogasawara Islands, which include Iwo Jima and the Volcano Islands (Kazan Retto), stretching some 1,100 kilometers from the main islands. A territorial dispute with Russia, dating from the end of World War II, over the two southernmost of the Kuril Islands, Etorofu and Kunashiri, and the smaller Shikotan Island and Habomai Islands northeast of Hokkaidō remains a sensitive spot in Japanese–Russian relations as of 2005. Excluding disputed territory, the archipelago covers about 377,000 square kilometers. No point in Japan is more than 150 kilometers from the sea. The four major islands are separated by narrow straits and form a natural entity. The Ryukyu Islands curve 970 kilometers southward from Kyūshū. The distance between Japan and the Korean Peninsula, the nearest point on the Asian continent, is about 200 kilometers at the Korea Strait. Japan has always been linked with the continent through trade routes, stretching in the north toward Siberia, in the west through the Tsushima Islands to the Korean Peninsula, and in the south to the ports on the south China coast. The Japanese islands are the summits of mountain ridges uplifted near the outer edge of the Hida, Kiso, and Akaishi mountains—that form the Japanese Alps (Nihon Arupusu), several of whose peaks are higher than 3,000 meters. 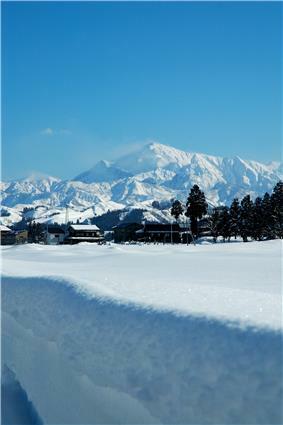 The highest point in the Japanese Alps is Mount Kita at 3,193 meters. The highest point in the country is Mount Fuji (Fujisan, also erroneously called Fujiyama), a volcano dormant since 1707 that rises to 3,776 meters above sea level in Shizuoka Prefecture. 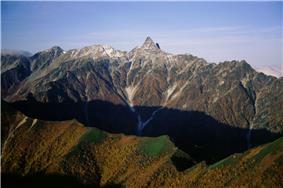 On the Sea of Japan side are plateaus and low mountain districts, with altitudes of 500 to 1,500 meters. None of the populated plains or mountain basins are extensive in area. The largest, the Kantō Plain, where Tokyo is situated, covers only 13,000 square kilometers. Other important plains are the Nōbi Plain surrounding Nagoya, the Kinai Plain in the Osaka–Kyoto area, the Sendai Plain around the city of Sendai in northeastern Honshū, and the Ishikari Plain on Hokkaidō. Many of these plains are along the coast, and their areas have been increased by reclamation throughout recorded history. The small amount of habitable land has prompted significant human modification of the terrain over many centuries. Land was reclaimed from the sea and from river deltas by building dikes and drainage, and rice paddies were built on terraces carved into mountainsides. The process continued in the modern period with extension of shorelines and building of artificial islands for industrial and port development, such as Port Island in Kobe and the new Kansai International Airport in Osaka Bay. Hills and even mountains have been razed to provide flat areas for housing. Rivers are generally steep and swift, and few are suitable for navigation except in their lower reaches. Most rivers are less than 300 kilometers in length, but their rapid flow from the mountains provides a valuable, renewable resource: hydroelectric power generation. Japan's hydroelectric power potential has been exploited almost to capacity. Seasonal variations in flow have led to extensive development of flood control measures. Most of the rivers are very short. The longest, the Shinano River, which winds through Nagano Prefecture to Niigata Prefecture and flows into the Sea of Japan, is only 367 kilometers long. The largest freshwater lake is Lake Biwa, northeast of Kyoto. Extensive coastal shipping, especially around the Seto Inland Sea (Seto Naikai), compensates for the lack of navigable rivers. The Pacific coastline south of Tokyo is characterized by long, narrow, gradually shallowing inlets produced by sedimentation, which has created many natural harbors. The Pacific coastline north of Tokyo, the coast of Hokkaidō, and the Sea of Japan coast are generally unindented, with few natural harbors. In November 2008 Japan filed a request to expand its claimed continental shelf. In April, 2012 the U.N. Commission on the Limits of the Continental Shelf recognized around 310,000 km2 of seabed around Okinotorishima, giving Japan priority over access to seabed resources in nearby areas. According to U.N. Commission on the Limits of the Continental Shelf, the approved expansion is equal to about 82% of Japan's total land area. The People's Republic of China and South Korea have opposed Japan's claim because they view Okinotorishima not as an island, but a group of rocks. Japan belongs to the temperate zone with four distinct seasons, but its climate varies from cool temperate in the north to subtropical in the south. Two primary factors influence Japan's climate: a location near the Asian continent and the existence of major oceanic currents. Two major ocean currents affect Japan: the warm Kuroshio Current (Black Current; also known as the Japan Current); and the cold Oyashio Current (Parent Current; also known as the Okhotsk Current). The Kuroshio Current flows northward on the Pacific side of Japan and warms areas as far north as Tokyo; a small branch, the Tsushima Current, flows up the Sea of Japan side. The Oyashio Current, which abounds in plankton beneficial to coldwater fish, flows southward along the northern Pacific, cooling adjacent coastal areas. The intersection of these currents at 36 north latitude is a bountiful fishing ground. 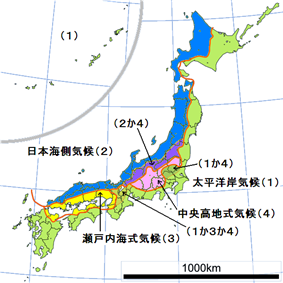 Its varied geographical features divide Japan into six principal climatic zones. Hokkaidō (北海道, Hokkaidō): Belonging to the humid continental climate, Hokkaidō has long, cold winters and cool summers. Precipitation is not great. Sea of Japan (日本海, Nihonkai): The northwest seasonal wind in winter gives heavy snowfalls, which south of Aomori mostly melt before the end of winter. In summer it is a little less rainy than the Pacific area but sometimes experiences extreme high temperatures due to the foehn wind phenomenon. Central Highland (中央高地, Chūō-kōchi): A typical inland climate gives large temperature variations between summers and winters and between days and nights. Precipitation is lower than on the coast due to rain shadow effects. Seto Inland Sea (瀬戸内海, Setonaikai): The mountains in the Chūgoku and Shikoku regions block the seasonal winds and bring mild climate and many fine days throughout the year. Pacific Ocean (太平洋, Taiheiyō): Winters are cold, with little snowfall, and summers are hot and humid due to the southeast seasonal wind. Precipitation is very heavy in the south, and heavy in the summer in the north. 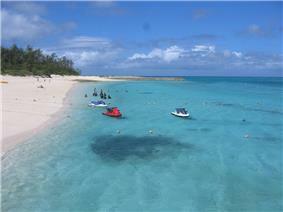 Ryukyu Islands (南西諸島, Nansei-shotō): This zone has a subtropical climate with warm winters and hot summers. Precipitation is very high, and is especially affected by the rainy season and typhoons. The climate from June to September is marked by hot, wet weather brought by tropical airflows from the Pacific Ocean and Southeast Asia. These airflows are full of moisture and deposit substantial amounts of rain when they reach land. There is a marked rainy season, beginning in early June and continuing for about a month. It is followed by hot, sticky weather. Five or six typhoons pass over or near Japan every year from early August to early September, sometimes resulting in significant damage. Annual precipitation averages between 1,000 and 2,500 mm (40 and 100 in) except in the hyperhumid Kii Peninsula where it can reach 4,000 millimetres (160 in), which is the highest rainfall in subtropical latitudes in the world. Maximum precipitation, like the rest of East Asia, occurs in the summer months except on the Sea of Japan coast where strong northerly winds produce a maximum in late autumn and early winter. Except for a few sheltered inland valleys during December and January, precipitation in Japan is above 25 millimetres (1 in) of rainfall equivalent in all months of the year, and in the wettest coastal areas it is above 100 millimetres (4 in) per month throughout the year. In winter, the Siberian High develops over the Eurasian land mass and the Aleutian Low develops over the northern Pacific Ocean. The result is a flow of cold air southeastward across Japan that brings freezing temperatures and heavy snowfalls to the central mountain ranges facing the Sea of Japan, but clear skies to areas fronting on the Pacific. Late June and early July are a rainy season—except in Hokkaidō—as a seasonal rain front or baiu zensen (梅雨前線) stays above Japan. 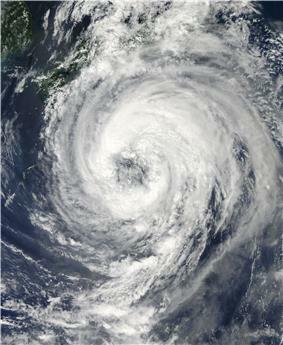 In summer and early autumn, typhoons, grown from tropical depressions generated near the equator, attack Japan with furious rainstorms. 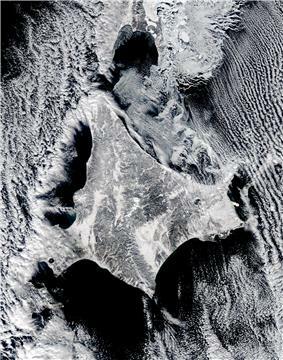 The warmest winter temperatures are found in the Nanpō and Bonin Islands, which enjoy a tropical climate due to the combination of latitude, distance from the Asian mainland, and warming effect of winds from the Kuroshio, as well as the Volcano Islands (at the latitude of the southernmost of the Ryukyu Islands, 24° N). The coolest summer temperatures are found on the northeastern coast of Hokkaidō in Kushiro and Nemuro Subprefectures. Sunshine, in accordance with Japan’s uniformly heavy rainfall, is generally modest in quantity, though no part of Japan receives the consistently gloomy fogs that envelope the Sichuan Basin or Taipei. Amounts range from about six hours per day in the Inland Sea coast and sheltered parts of the Pacific Coast and Kantō Plain to four hours per day on the Sea of Japan coast of Hokkaidō. In December there is a very pronounced sunshine gradient between the Sea of Japan and Pacific coasts, as the former side can receive less than 30 hours and the Pacific side as much as 180 hours. In summer, however, sunshine hours are lowest on exposed parts of the Pacific coast where fogs from the Oyashio current create persistent cloud cover similar to that found on the Kuril Islands and Sakhalin. As an island nation, Japan has a long coastline. A few prefectures are landlocked: Gunma, Tochigi, Saitama, Nagano, Yamanashi, Gifu, Shiga, and Nara. As Mt. Fuji and the coastal Japanese Alps provide a rain shadow, Nagano and Yamashi Prefectures receive the least precipitation in Honshū, though this still exceeds 900 millimetres (35 in) annually. A similar effect is found in Hokkaidō, where Okhotsk Subprefecture receives as little as 750 millimetres (30 in) per year. All other prefectures have coasts on the Pacific Ocean, Sea of Japan, Seto Inland Sea or have a body of salt water connected to them. Two prefectures—Hokkaidō and Okinawa—are composed entirely of islands. The hottest temperature ever measured in Japan, 41.0 °C (105.8 °F), occurred in Shimanto, Kochi on August 12, 2013. Environment - current issues: In the 2006 environment annual report, the Ministry of Environment reported that current major issues are: global warming and preservation of the ozone layer, conservation of the atmospheric environment, water and soil, waste management and recycling, measures for chemical substances, conservation of the natural environment and the participation in the international cooperation. Ten percent of the world's active volcanoes—forty in the early 1990s (another 148 were dormant)—are found in Japan, which lies in a zone of extreme crustal instability. As many as 1,500 earthquakes are recorded yearly, and magnitudes of 4 to 7 in magnitude are common. Minor tremors occur almost daily in one part of the country or another, causing slight shaking of buildings. Major earthquakes occur infrequently; the most famous in the twentieth century was the great Kantō earthquake of 1923, in which 130,000 people died. 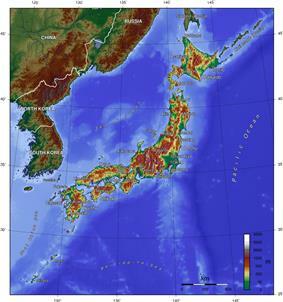 Undersea earthquakes also expose the Japanese coastline to danger from tsunamis (津波) and tidal waves. On March 11, 2011 the country was subject to a devastating magnitude 9.0 earthquake and a massive tsunami as a result. The March 11 quake was the largest ever recorded in Japan and is the world's fourth largest earthquake to strike since 1900, according to the U.S. Geological Service. It struck offshore about 371 kilometres (231 mi) northeast of Tokyo and 130 kilometres (81 mi) east of the city of Sendai, and created a massive tsunami that devastated Japan's northeastern coastal areas. At least 100 aftershocks registering a 6.0 magnitude or higher have followed the main temblor. At least 15,000 people died as a result. Japan has become a world leader in research on causes and prediction of earthquakes. The development of advanced technology has permitted the construction of skyscrapers even in earthquake-prone areas. Extensive civil defence efforts focus on training in protection against earthquakes, in particular against accompanying fire, which represents the greatest danger. Another common hazard are several typhoons that reach Japan from the Pacific every year and heavy snowfall during winter in the snow country regions, causing landslides, flooding, and avalanches. Japan is informally divided into eight regions. Each contains several prefectures, except the Hokkaidō region, which covers only Hokkaidō Prefecture. The region is not an official administrative unit, but has been traditionally used as the regional division of Japan in a number of contexts: for example, maps and geography textbooks divide Japan into the eight regions, weather reports usually give the weather by region, and many businesses and institutions use their home region as part of their name (Kinki Nippon Railway, Chūgoku Bank, Tohoku University, etc.). While Japan has eight High Courts, their jurisdictions do not correspond to the eight regions. This is a list of the extreme points of Japan, the points that are farther north, south, east or west than any other location. The only part of Japan with antipodes over land are the Ryukyu Islands, though the islands off the western coast of Kyūshū are close. The northernmost antipodal island in the Ryukyu Island chain, Nakanoshima, is opposite the Brazilian coast near Capão da Canoa. The other islands south to the Straits of Okinawa correspond to southern Brazil, with Gaja Island being opposite the outskirts of Santo Antônio da Patrulha, Takarajima with Jua, Amami Ōshima covering the villages of Carasinho and Fazenda Pae João, Ginoza, Okinawa with Palmas, Paraná, the Kerama Islands with Pato Branco, Tonaki Island with São Lourenço do Oeste, and Kume Island corresponding to Palma Sola. The main Daitō Islands correspond to near Guaratuba, with Oki Daitō Island near Apiaí. The Sakishima Islands beyond the straits are antipodal to Paraguay, from the Brazilian border almost to Asunción, with Ishigaki overlapping San Isidro de Curuguaty, and the uninhabited Senkaku Islands surrounding Villarrica. ^ a b "Japan granted more continental shelf". Upi.com. Retrieved 29 April 2012. 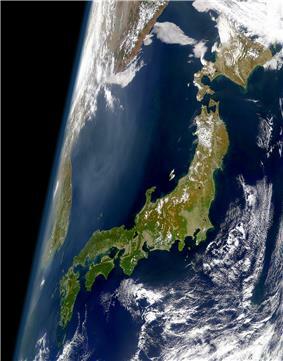 All Geography of Japan information taken from the Japan entry at The World Factbook.